The season for gifting is here. It’s a season full of fun, parties, family, friends, and STRESS. I always stress about giving the perfect gifts. I feel like they should reflect sincere thought, be affordable for me to acquire, and be something someone would actually like. And I prefer gifts to be handmade whenever possible. For the next several weeks I’ll be posting a series of blog posts with handmade tutorials and gift ideas. Gifts you can sew, stitch, knit, print, and more. First up, customized napkins. You know you love all those cute little fabrics we have in the shop. Now you have a project to use them. You can purchase yardage, or keep things simple and just use a stack of adorable fat quarters to make an assortment. You can use them as furoshiki gift wrap, wrap up baked goods for your favorite hostess, give a set, or even make them for your own table to add a personalized touch. Or, take these instructions and lengthen and/or widen to make all sorts of things, like a head wrap, scarf, table runner, and more. 1. To prevent uneven shrinkage, I recommend pre-washing the fabric and then ironing the washed and dried fabric smooth. You can go ahead and work without washing if you aren’t worried about a little handmade rustic touch to your edges. 2. Trim your napkins to an even rectangle or square for your desired size napkin. If you want to maximize the fat quarter, your cut napkin will be approximately 17.5” x 21.5” depending on the fabric. Typical dinner napkins are 20” square, and cocktail napkins are 16” square. 3. Once your napkins are cut to size, place the fabric with the right side down (the side with the pattern) and iron ¼ inch of each edge to the wrong side. 4. Then iron each side another ¼ inch again. 5. Now decide if you like mitered corners or simple overlap corners. 6. For simple overlapped corners, simply pin and stitch around the perimeter of your folded and pressed edges. 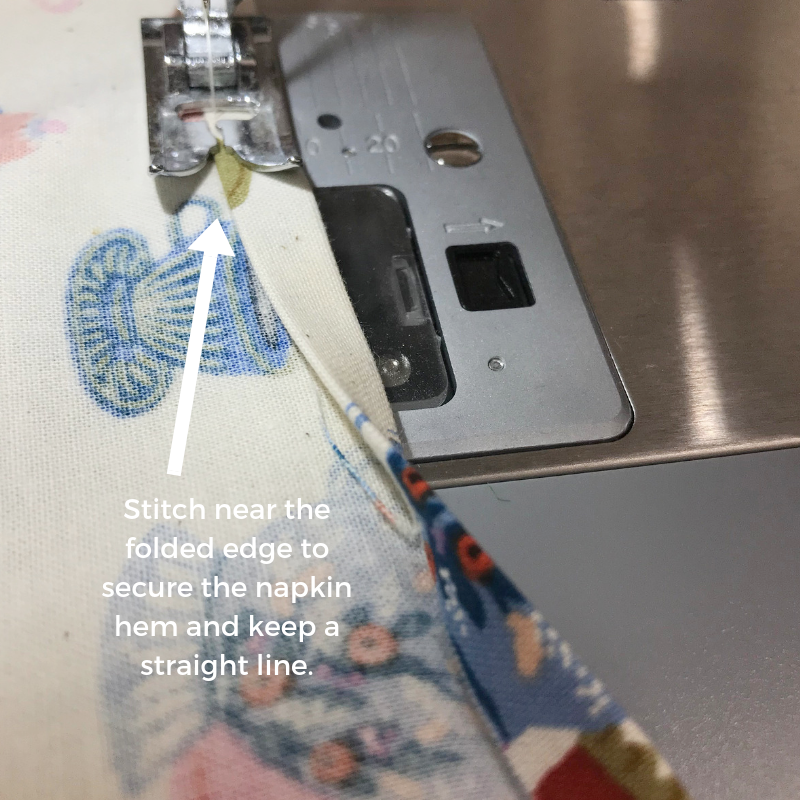 As you reach each corner, stitch to the corner, leave the needle in the down position, lift the presser foot, pivot to turn the fabric (leaving the needle in the fabric to avoid any gaps in your stitching) and then continue stitching on the new side of the napkin. 7. For mitered corners, you will unfold the second folded edge. Take the folded corner and fold it ¼ inch to the wrong side (extending past the two turned and pressed edges). 8. Now fold the two edges over again, creating a mitered corner. Pin the corner in place. 9. Do this for each corner. Then stitch around the perimeter to secure each edge and corner. As you reach each corner, stitch to the corner, leave the needle in the down position, lift the presser foot, pivot to turn the fabric (leaving the needle in the fabric to avoid any gaps in your stitching) and then continue stitching on the new side of the napkin. And you’re finished. You can use this technique with so many different fabrics and sizes of projects. Make fanciful napkins, dish towels, scarves, head wraps, and more with this technique. You can even embellish your stitched creations with embroidery, block printing, cross stitch, or any other fun touch you can imagine. And, to make it even easier, you can find all the materials, supplies and kits in our shop. Save time shopping and get to the making! More fun time for you. Find curated bundles of fun prints and even linen/cotton canvas prints for a heavier weight napkin ready for you to buy quickly and take home. Making towels? We have leather strips to add a special hanging hook. Be sure to check back for our next tutorial.